GDANSK, Poland– The new European Solidarity Centre has opened next to the famous Gdansk shipyards in Poland. Built over five stories, it has been designed to give the impression of walls cracking and tilting, and is covered in rust-colored sheet metal resembling a ship’s hull. Conceived as an homage to former president, Lech Walesa, it represents a symbol of the peaceful victory of the Solidarity (NSZZ Solidarność) movement of which he was leader. Providing a fully integrated, world-class audio system, ESS Audio provided a variety of solutions from the HARMAN Professional portfolio. The permanent exhibition at the European Solidarity Centre now occupies an area of ​​almost 3,000 square meters of the building’s first and second floors, the main theme being the activity of the trade unions that led to democratic changes across Central and Eastern Europe. The conventional exhibition merges with the latest multimedia solutions, in a series of presentations that includes photographs, film archives, documents and maps, as well as multimedia presentations. The principal requirement in the main multifunctional hall was to transmit microphone signals at conferences, meetings and seminars while the overall digital system would play multimedia content, background music and so on. 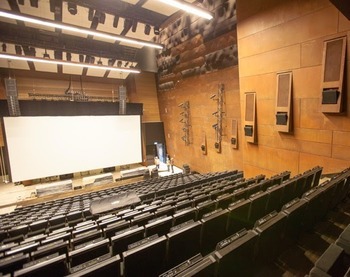 Since cinema is among the media hosted in the multipurpose hall, ESS Audio specified a JBL cinema surround sound system. This comprises three JBL 3732 3-way loudspeakers, two JBL 4642A subwoofers and 19 JBL 8340A surround loudspeakers, all driven by Crown DSi 2000 amps. The main full-band loudspeakers and subwoofers are set on trolleys, so they can be moved away when not in use. The main sound reinforcement system comprises two hangs of eight JBL VERTEC® VT4886 subcompact line array loudspeakers per side, with a Soundcraft Vi6 optical 96-channel digital mixing console. Controlling and boosting the digital signage are four BSS Soundweb London BLU-800 DSP’s populated with AEC (Acoustic Echo Cancellation) Input Cards. This manages 14 JBL CBT50LA column loudspeakers (two CBT50LA’s for every LCD monitor), which are powered by four Crown ComTech DriveCore CT4150 amps and Crown CT16S 16-input amplifier switchers. AKG PZM10 boundary measurement microphones are connected to the BSS Audio processors, and adjust the sound volume in every multimedia set-up. AKG microphones are also in heavy use throughout, headed by a DMS700 digital wireless system comprising six DSR700 receivers and 12 DHT-700/D5 handheld transmitters and six DPT 700 bodypack transmitters (and HC577L headworn mic). Other microphones include six dynamic D7 and six C5 handheld condenser microphones. All this equipment is available for use in the main hall, as well as the stage in the foyer, according to requirements. Meanwhile, the exhibitions rooms have been equipped with a distributed sound system, consisting of 30 JBL Control 24CT Micro Plus-Black and four JBL Control 25T ceiling and wall loudspeakers. All are driven by Crown CDi1000 amps and controlled by two Soundweb London BLU-100 processors. Finally, ESS Audio supplied a roving mobile sound reinforcement system, comprising a Soundcraft Si Expression 2 console, six JBL VRX932LAP powered Constant Curvature loudspeakers and six VRX918SP subs. The contract for the technical fit-out was issued by Gdańskie Inwestycje Komunalne Sp. z o.o. (Gdańsk Municipal Investments Ltd.), on behalf of the local Gdańsk City Municipality (Gmina Miejska w Gdańsku). This was awarded to the consortium of RGBS Systemy Audiowizualne Sp. z o.o./ Awaco Project Sp. z o.o.